The 2017 EdTechX conference took place London this past June. Cultural Infusion’s CEO and founder Peter Mousaferiadis was invited by WISE, an initiative of the Qatar Foundation, to present his Founder Story. I stand before you not as a son of Greek migrants who travelled to Australia for a better life in the 1950s, but rather as a human being who stands in the shadow of a Greek philosopher who lived 2400 years ago: Diogenes. He was the first human being to proclaim “I am a citizen of the world”. The notion of a “citizen of the world” resonates with all of us and postulates that all human beings belong to a global community based on shared morality. The advent of the World Wide Web (WWW) in 1989 has created a global super-connected age. Today, the ability to navigate our way through how we see the world and how we relate to each other has become central to being a citizen of the world. My name is Peter Mousaferiadis. I have spent 29 years working as a creative director, music conductor, composer, agent and producer. In 2002, I founded Cultural Infusion as a response to the impact of globalisation on society, as a means to addressing issues of lack of understanding of the other and as a way of reducing ethnic and race based discrimination. Over three decades, I have come to realise the power of the arts, the power of culture and that as a people we don’t do enough to draw upon humanity’s greatest asset – cultural diversity. Cultural diversity is our most recognised brand, yet our most under-utilised brand. Cultural Infusion today has grown to more than 40 staff and delivers programs in 5 countries to more than 350,000 students annually. It really wasn’t until that moment that the light bulb came on. I realised everything I did was not because of the actions I was involved with, but what drove me. The purpose behind what I did. The WHY. Everything I was involved with always used arts and culture as a meaningful driver to building intercultural understanding as a core value and a key competency of global citizenship. I can’t stress enough why we do what we do at Cultural Infusion. According to the 2016 Global Peace Index, 13.3% of the world’s GDP is spent on dealing with the cost of violence. A lot of money. This equates to 13.6 trillion dollars. Now, according to UNESCO, 75% of all conflict has a cultural dimension. If 75% of all conflict has a cultural dimension, then education is the solution. Culture is a mighty force. So much so that UNESCO has officially recognised culture as an enabler and driver of sustainable development and that culture is key to quality education, poverty eradication, a way of building socially cohesive and peaceful communities and, last but not least of all, a driver of innovation. Yes, globalisation brings with it global issues. Issues like disharmony, exclusion, racism and even iPad addiction. The first three are problems we can address with education. The last I saw as an opportunity when I noticed my children’s heads were buried all day long in their tablet devices. If my kids, like everyone else’s kids, are going to have their heads buried in gadgets, then let’s use them to open their minds and hearts. At Cultural Infusion, we have tirelessly worked away to create a new narrative. Joko’s World and our digital apps are a culmination of the last three decades of my work, my passion, to tell the story that we all exist because of each other and that the lifeblood of culture is confluence. It’s never been otherwise. 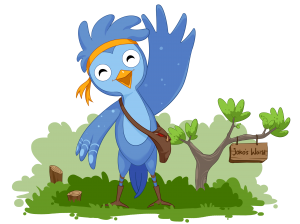 Joko, a blue nightingale, invites children, through music and storytelling and most importantly fun and gamification, to explore cultures of the world all with the view of building global harmony.